The morning stayed dry and bright with another good wind picking up from the SSW which meant that Sale Fell was to have its influence on proceedings. Not only were conditions gusty again, there were some big shifts and down-draughts to contend with resulting in a spinnaker reach from N0S to 8 turned into a beat for some. The rain moved in over lunch and the wind shifted more to the South so that the OD opted to use the southern end of the lake for racing. Despite having checked the wind down the lake, when the lead boats reached the far end, the wind had shifted, and there were more down-draughts and numerous holes in the wind – just what you need when the rain has settled in! At the first prize giving of the week, the multitude of prizes were provided by our lead sponsor, The Lakes Distillery. 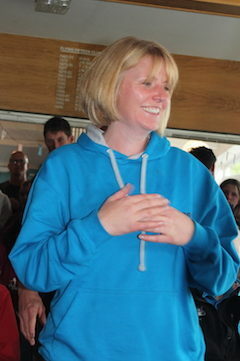 Jo Van Lachterop, one of our newest members to sailing was delighted to win her first sailing prize for coming 2nd overall crewing for her instructor Ant Woodyer in the slow handicap fleet. Quiz night was as popular as ever with the early evening kids version, followed by one for adults. It was the Bass Cocktail Queens that took the honours, with a half point lead, and a pure coincidence that there were some close links with guest quiz master Jon Denwood, comprising his wife, daughter and sister, together with his start boat team for his forthcoming OD duty!